Another study, published in the same journal in March 2012, revealed that 95% of curtains studied were contaminated with either MRSA or vancomycin-resistant enterococcus (VRE) on at least one occasion over a three-week period. Authors of this study also recommended intervention to reduce contamination. Employees in the medical field care about their patients. But at the same time, it’s easy for healthcare workers to feel frustrated with these results. For medical personnel who are already taxed, it’s yet another task on the “to do” list. For the finance department tasked with managing costs, it’s yet another expense for new curtains or higher laundry costs. Hospitals already depend on cleanliness to reduce infections and are frequently wiping down surfaces and changing bed linens. Administrators must be diligent even more so now to ensure that patients and staff don’t contract hospital acquired infections from the hospitals’ cubicle curtains. This may involve revising policies and procedures on cubicle curtain cleaning. Or it may require new curtains on a more frequent basis. Regardless, purchasers are now responsible for finding the middle ground between curtains that are inexpensive and easy to dispose of and resilient—perhaps more expensive—curtains that require low maintenance. One way to keep bacteria at bay is to implement the use of cubicle curtains with antimicrobial properties. A study published in 2012 revealed that antimicrobial privacy curtains were contaminated significantly less than standard curtains after four weeks. 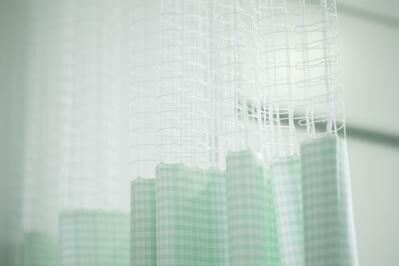 Antimicrobial curtains also took substantially more time to become contaminated. While antimicrobial cubicle curtains will need to be cleaned less frequently than standard curtains, cleaning is essential to the health of patients and staff. Low maintenance privacy curtains will not only cut down the time staff spends cleaning but also keep the costs of laundering at a minimum. Antimicrobial cubicle curtains are becoming more popular, but few brands offer curtains that are easy to care for as well. Sure-Chek® Linen, however, is an antimicrobial privacy curtain that doesn’t require laundering. Rather than disassembling your curtains and replacing them, you can simply clean in place using neutral soap suds and lukewarm water. Using this procedure helps ensure a long life for an already durable fabric. Sure-Chek® cubicle curtains are also flame resistant, stain resistant, odor resistant, and antistatic. Your patients and staff no longer need to be alarmed. Sure-Chek® protects while providing a pleasant experience at the same time—for patients, personnel, and administrators alike. Contact us and learn more about antimicrobial textiles.